Definition at line 264 of file llinventory.h. Definition at line 267 of file llinventory.h. Definition at line 1339 of file llinventory.cpp. Definition at line 1317 of file llinventory.cpp. Definition at line 1327 of file llinventory.cpp. Definition at line 1333 of file llinventory.cpp. Definition at line 1344 of file llinventory.cpp. 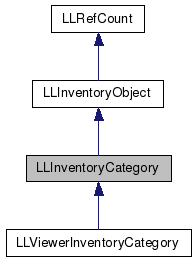 Referenced by LLViewerInventoryCategory::copy(), and LLInventoryCategory(). Definition at line 1453 of file llinventory.cpp. References LLAssetType::lookup(), LLInventoryObject::mName, LLInventoryObject::mParentUUID, mPreferredType, LLInventoryObject::mType, LLInventoryObject::mUUID, LLUUID::toString(), TRUE, and UUID_STR_LENGTH. Definition at line 1532 of file llinventory.cpp. Definition at line 1350 of file llinventory.cpp. Referenced by LLInventoryModel::buildParentChildMap(), LLFolderBridge::dragCategoryIntoFolder(), LLFolderBridge::folderOptionsMenu(), LLFolderBridge::getIcon(), LLFolderBridge::isItemRemovable(), LLFolderBridge::isItemRenameable(), LLNoPreferredTypeOrItem::operator()(), and LLNoPreferredType::operator()(). Definition at line 1387 of file llinventory.cpp. 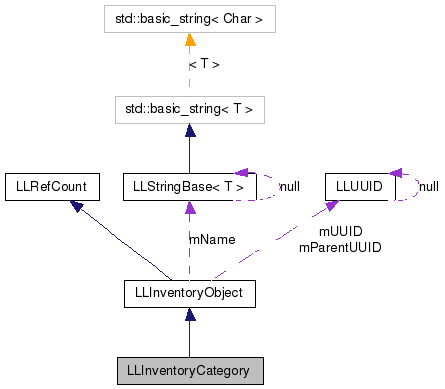 References llendl, llwarns, LLAssetType::lookup(), MAX_STRING, LLInventoryObject::mName, LLInventoryObject::mParentUUID, mPreferredType, LLInventoryObject::mType, LLInventoryObject::mUUID, NULL, LLStringBase< char >::replaceChar(), LLStringBase< char >::replaceNonstandardASCII(), LLUUID::set(), and TRUE. Definition at line 1470 of file llinventory.cpp. References llendl, llwarns, LLAssetType::lookup(), MAX_STRING, LLInventoryObject::mName, LLInventoryObject::mParentUUID, mPreferredType, LLInventoryObject::mType, LLInventoryObject::mUUID, LLStringBase< char >::replaceChar(), LLStringBase< char >::replaceNonstandardASCII(), LLUUID::set(), and TRUE. Definition at line 1361 of file llinventory.cpp. References _PREHASH_FolderID, _PREHASH_Name, _PREHASH_ParentID, _PREHASH_Type, LLMessageSystem::addS8Fast(), LLMessageSystem::addStringFast(), LLMessageSystem::addUUIDFast(), LLInventoryObject::mName, LLInventoryObject::mParentUUID, mPreferredType, LLInventoryObject::mUUID, and type. Definition at line 1355 of file llinventory.cpp. Definition at line 1371 of file llinventory.cpp. References _PREHASH_FolderID, _PREHASH_Name, _PREHASH_ParentID, _PREHASH_Type, DB_INV_ITEM_NAME_BUF_SIZE, LLMessageSystem::getS8Fast(), LLMessageSystem::getStringFast(), LLMessageSystem::getUUIDFast(), LLInventoryObject::mName, LLInventoryObject::mParentUUID, mPreferredType, LLInventoryObject::mUUID, LLStringBase< char >::replaceNonstandardASCII(), and type. Definition at line 298 of file llinventory.h. Referenced by copy(), exportFile(), LLViewerInventoryCategory::exportFileLocal(), exportLegacyStream(), getPreferredType(), importFile(), LLViewerInventoryCategory::importFileLocal(), importLegacyStream(), packMessage(), LLViewerInventoryCategory::removeFromServer(), setPreferredType(), unpackMessage(), and LLViewerInventoryCategory::updateServer().